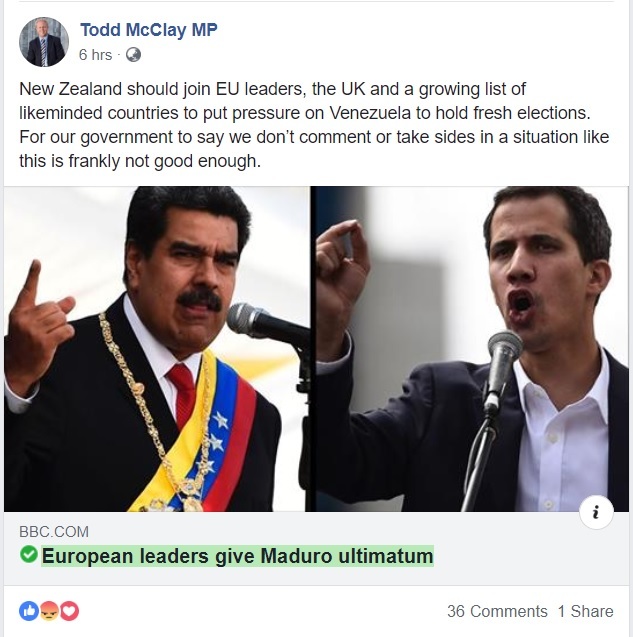 Despite two of their henchmen, Simeon Brown MP and Chris Penk MP, brandishing the incumbent Coalition Government as “globalists” who “undermine New Zealand sovereignty”, the National Party seems to have no problem blindly obeying orders from the United States and the European Union to interfere in the sovereign affairs of another country – Venezuela. On the 23rd of January, the Latin American nation’s Opposition Leader Juan Guaido proclaimed himself as the “interim President” of Venezuela after previously declaring that the inauguration of elected-President Nicolas Maduro on the 10th of January was “illegitimate”. Those accusations came even as the latter won 67.8% of the votes in the 2018 general elections. Venezuela’s self-proclaimed “interim President” Juan Guaido. 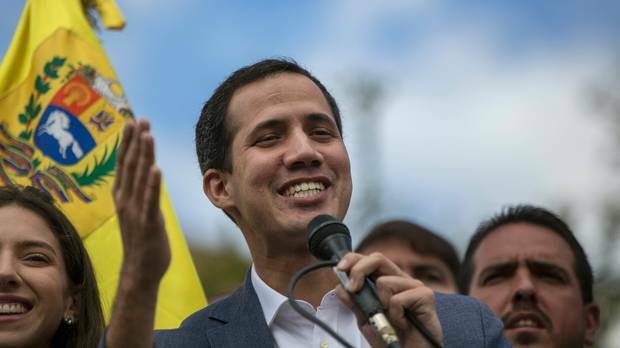 Alongside Guaido and his party, US President Donald Trump also rejected the results of Venezuela’s elections and later declared that his administration recognized Guaido as the rightful president. Going further, the U.S. – through its top diplomat Mike Pompeo – called on the rest of the world to “pick a side” in the ongoing crisis, and were quickly obeyed by their allies Canada, United Kingdom and most of the European Union. 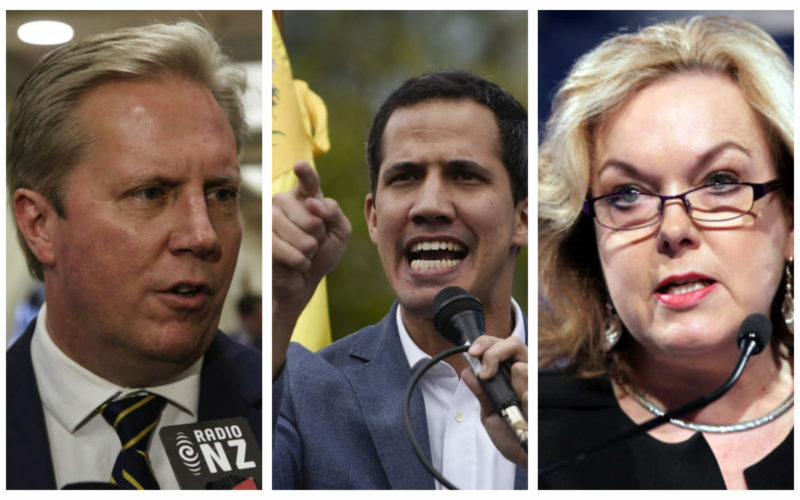 After Australia’s Scott Morrison went the same way on the 28th of January, the only “Five-Eyes” member left who has not yet thrown its support for Guaido is New Zealand. Shortly thereafter, our Foreign Affairs Minister Winston Peters declared that the Coalition Government will not back any side in the crisis, as “it is not its practice to do so”. The decision effectively means that New Zealand will strictly observe an independent foreign policy, rather than heed the orders of Trump or join the ranks of Russia, China and Turkey. Peters added that Venezuela “needed to decide its future through free and fair elections”, rather than pressure from the international community. 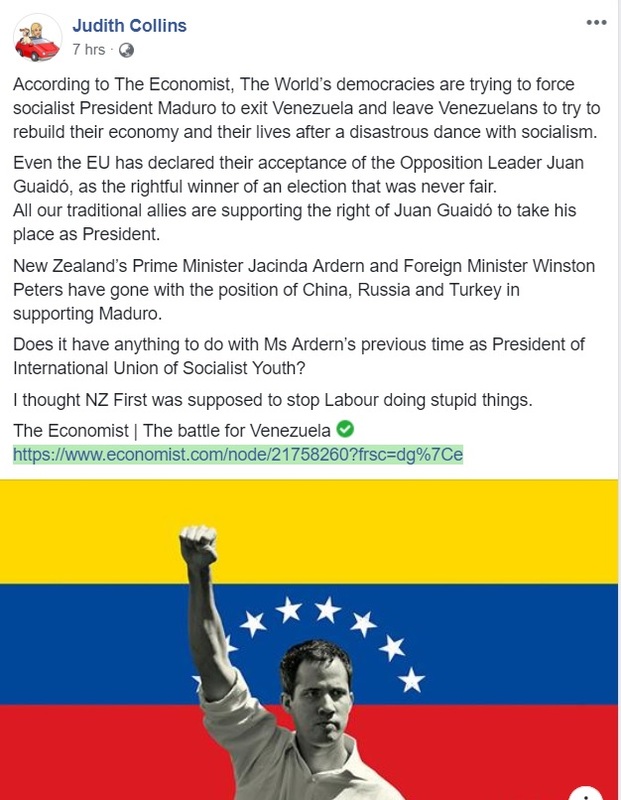 Effectively, what the New Zealand First leader is saying, is that he respects the sovereignty of Venezuela and their right to determine their own leadership through democratic processes. Peters’ party is widely known for their nationalist principles, and they are showing it once again with this decision. The Foreign Minister and New Zealand in general were praised globally for taking this stance, after news of the decision caught the eye of international media. Naturally, the main opposition party – the National Party – whose previous leader, Sir John Key, was known to be a staunch US-ally found an angle to criticize the Coalition Government for their decision. National’s criticisms were not only scaremongering, but some were downright deceptive also. The party’s spokesperson for Foreign Affairs – Todd McClay MP – called the decision “not good enough”. He pressed on the Government to join the ranks of the EU, the UK, “and like-minded countries”, in recognizing Guaido as the leader of Venezuela. For National’s foreign policy mouthpiece, it is preferable for New Zealand to ditch its desire to have an independent foreign policy in order to kowtow to the demands of the US and other allies aligned with the North American superpower. One of the party’s most notable figures and former candidate for leader, Judith Collins MP, stretched the truth a lot further in her criticism of the Government’s decision. She wrote in a Facebook post that New Zealand – under PM Ardern and Peters – “has gone with the position of China, Russia and Turkey”. Clearly, that is a blatant lie. New Zealand’s decision was to remain neutral and not choose any side in the Venezuelan crisis, neither the U.S.-endorsed position nor that of China, Russia and Turkey which was to back incumbent leader Nicolas Maduro. 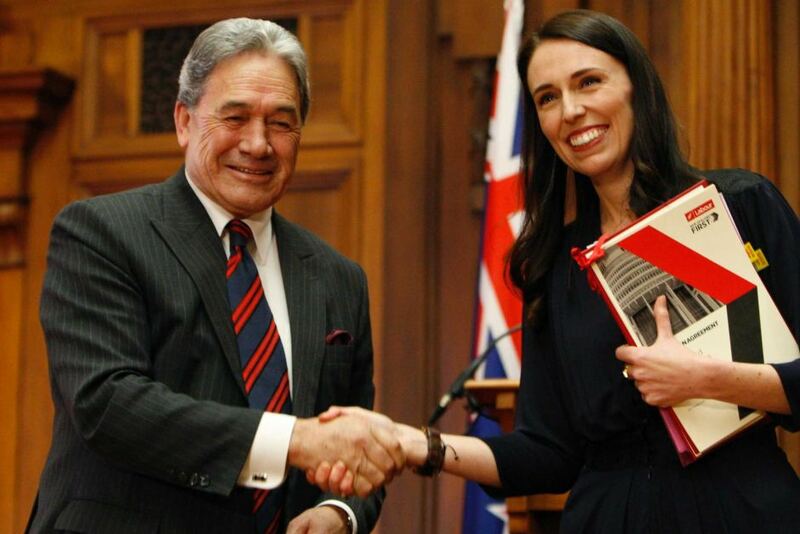 She also took a further leap and linked their decision to the previous experience of Prime Minister Ardern with student politics, being the leader of the International Union of Socialist Youth in her 20’s. The desperation of the National Party to regain power is showing in their senseless and scaremongering attacks on the Government’s decision to pursue an independent foreign policy. When Foreign Minister Peters voted in favour of the UN Global Compact, their Party loudly trumpeted that the current Government was “globalist” and that their decision would erode New Zealand’s sovereignty. Yet suddenly, to score a cheap hit on the Government and boost their chances in next year’s elections., they do not have a problem throwing New Zealand’s sovereign right to determine its own foreign policy under the bus and blindly follow Donald Trump’s foreign policy.